I've been watching people play D&D for over a year and started playing a few months ago. I also recently started playing Pathfinder, and I thought it would be interesting to write a bit about both, as a sort of "first impressions" regarding Pathfinder, since this blog will mostly focus on D&D when it comes to tabletop RPGs. Both systems allow you to Multiclass into a different class later on. The Alignment system is similar in both, although Pathfinder gives you specific rules in how to keep track of your alignment in case you want your characters' alignment to evolve throughout the story. Most of these differences in terminology are due to the fact that Pathfinder is the equivalent to the 3rd edition of Dungeons and Dragons (it was built with the contents that Wizards of the Coast released into public domain). D&D 3.5 used a lot of the terminology still being used in Pathfinder. You have 78 Flaws to choose from. You have 99 Feats to choose from and can get 5 at most if you reach level 20. You can break down your full movement into smaller increments, allowing you to move-attack-move. Four types of combat actions: action, bonus action, reaction, and movement. Some abilities may also grant you one or more extra attacks. While in combat, a player provokes attacks of opportunity (a free attack) from enemies when they move away from the enemy's melee range. You have 15 status' Conditions. When you drop to 0 hit points you become unconscious. If you're healed by an ally, you immediately get back to at least 1 hit point. You have only your basic Armor Class. The players can level up by gaining XP, completing certain milestones or a combination of both. There is only 1 XP table. There are 18 Skills in total. Huge variety of basic races and classes to choose from. You have 64 Drawbacks to choose from (and 42 extra 3rd party Drawbacks). You have 1128 personality Traits to choose from (divided into Basic - Combat, Faith, Magic, Social -, Campaign, Equipment, Faction, Race, Regional, and Religion). You have way too many Feats to count (but you're welcome to try) to choose from and can get 10 in total if you reach level 20. You cannot move before and after an attack, unless you have the Spring Attack (Combat) Feat, that requires you to have also the Dodge and Mobility feats first. Six types of combat actions: full-round action, standard action, free action, swift action, immediate action, and move action. Some abilities may also grant you one or more extra attacks. While in combat, a player provokes attacks of opportunity (a free attack) from enemies not only when they move away from the enemy's melee range, but when they do a number of things within that same range (unsheathe or sheathe a weapon, drink a potion, stabilize an ally). You have 36 status' Conditions. When you drop to 0 hit points you become unconscious. If you drop below 0, you start gaining negative hit points. Getting healed by an ally does not automatically bring you back to 0 or 1 hit points, you need to regain all your lost hit points naturally or through more magic healing. You have your basic Armor Class, a Touch Armor Class, and the Flat-Footed condition. The players advance only by gaining traditional XP during combat. The XP table has 3 different options: slow, medium, and fast. There are 35 Skills in total and you can also have 3 different Craft skills, 2 different Perform and 2 different Profession, raising that total to 39. Making my first Pathfinder character (while trying to also learn some basic rules) took me about three times as long than doing the same for D&D 5e. This makes D&D 5e a lot more beginner (and even GM) friendly. D&D 5e also strikes me as more child-friendly, not just the rules for combat are more simplified and it's faster to make a character (children don't necessarily want to bother wasting time learning a lot of rules they see as unnecessary, they just want to jump right into the action), but also because there is a Trait in Pathfinder called Prostitute, as well as a few other references to the word. When it comes to content such as traits, skills, and feats, some people might think the amount present in Pathfinder is way too overwhelming and going through it all is too time-consuming, while others might feel that there isn't enough content in D&D 5e to meet their expectations. It all comes down to what kind of player you are and what you're looking for in the game. While D&D is a bit more flexible, and thus better for people who prefer improvisation and custom-made rules, Pathfinder is more suited for people who prefer a game with a full set of rules (thus covering more player actions and removing improvisation out of the equation) or a more complex mechanic system. Pathfinder strikes me as being best suited for more experienced players (not necessarily veterans) who are in search of a challenge. However, if you're a fan of more simplified systems but really want to give Pathfinder a try because you want to learn other systems, not all is lost. 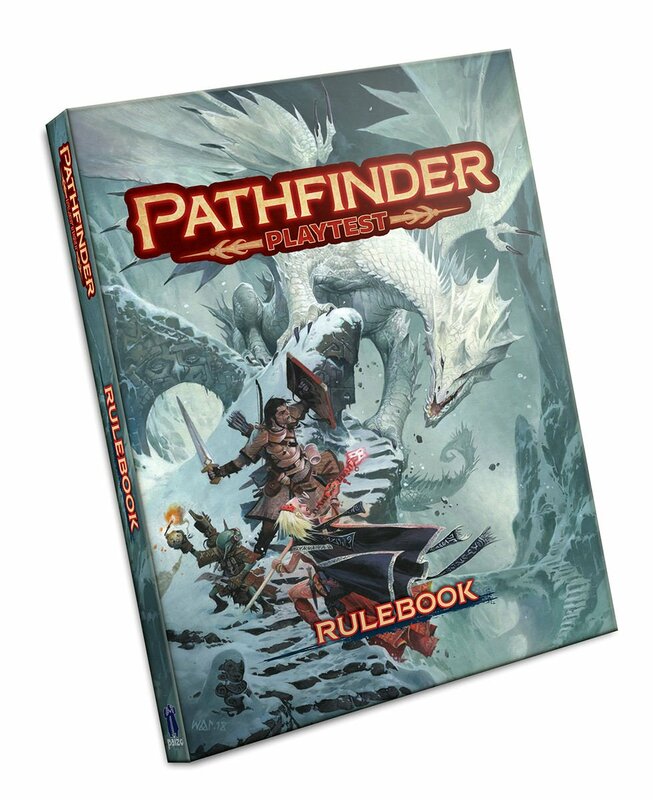 The 2nd version of Pathfinder is already being worked on (final release is scheduled for 2020) and you can download all their Playtest material for free on the Paizo website and give Paizo your feedback with any changes or improvements you'd like to see incorporated into the game. Compared to the original version of Pathfinder, the rules do seem a lot more simplified and intuitive (especially the combat rules) and, so far, everything seems really promising. I will definitely be taking this Playtest for a spin with some friends. What about you? Have you ever played D&D 5e or Pathfinder before? Which one do you prefer and why? Let me know in the comments below.